In response to a sharp rise in inbound enquiries, and shocking statistics released by the government which claim a 40% rise in religious hate-crimes since 2017 (12% of which is anti-Semitic, the second most common target of religious hate crimes) *, The National Holocaust Centre and Museumhas commissioned an innovative short film,Edek, to educate and encourage young people to stand up to hate. 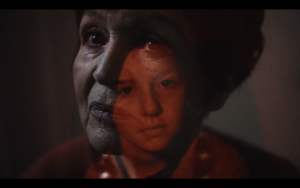 Artfully directed, Edek (05:57) features 86-year-old Holocaust survivor Janine Webber, who tells the heartbreaking and courageous story of the man who risked his life to hide Janine, her aunt, her uncle and 12 other Jews for over a year from the Nazis during the Second World War. Janine details her incredibly moving journey, from being nine-years-old and losing her mother and family, to the kindness she found in a complete stranger. In stark contrast to Janine’s storytelling is American artist Kapoo; who brings a modern, urban take, linking the past and present through a bespoke hip-hop composition. The film reminds us of the bravery and humanity required in standing up to intolerance and hatred – whatever your religion or ethnicity. A history lesson for the YouTube age, the film educates young people to think about the horrors of the Holocaust and draws parallels between past atrocities and the hate crimes of today. Viewers are encouraged to stand up and act, by sharing the film and supporting its message across social media, using the hash tag #edek. “Sadly, we’re not surprised by the recent shocking statistics” says Phil Lyons, Chief Executive at The National Holocaust Centre and Museum. “We’ve seen a stark increase in enquiries – from schools and police forces – trying to stamp out ideological and religious hate crimes. Society has yet to truly learn the lessons of the Holocaust. This is why with Edek, we are challenging the norms of Holocaust education. We believe creativity and innovation are vital tools to inspire young people to apply the Holocaust to their own lives. Otherwise,passivity can kill. We want to encourage active resistance to the rising tide of hatred out there today”. “We made this film to speak to young people in a visual and verbal language that is theirs, not ours”added Marc Cave, a Trustee of the Museum who executive-produced Edek. Edek is available to view here, and is being showcased at a number of prestigious festivals including Leeds International Film Festival (November 3), Aesthetica Short Film Festival (November 8, 9 and 10), Warsaw Jewish Film Festival (November 17), UK Jewish Film Festival (November 12, 14 and 18) and Norwich Film Festival (November 17) where it is also shortlisted for Best Documentary. The film has already won the Audience Award at Wimbledon International Shorts, Best Short Documentary nominations at the Miami Independent Film Festival and British Documentary Film Festival and Award of Excellence awards at the US film festivals Best Shorts, Docs Without Borders and Impact Docs. Please follow The National Holocaust Centre and Museum’s official social channels, Facebook, Twitter and Instagram, and share the video now across social media using #edek.